This book explores the relationship between science and society, using the field of Astrobiology as an example. Jakosky’s goal, as he states in his preface, is to investigate the philosophical and societal issues in astrobiology. This focuses in particular on encouraging the specialists in science and the humanities to communicate more effectively with each other, with the idea that both sides will benefit greatly from doing so. 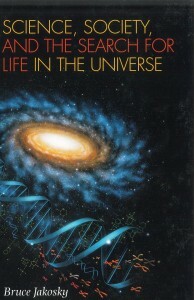 The book begins on a scientific note, by introducing astrobiology as a popular and historical science, and then discusses deeper questions such as determining what life is, and whether or not astrobiology is indeed even a science. With this perhaps slightly over-extensive background fresh in the reader’s mind, Jakosky starts analyzing science from a philosophical and societal point of view, pointing out problems relating to the lack of understanding from the public of what happens in the scientific world, and the contradictions that exist between the public’s interest and the lack of interactive communication from the scientific community. In doing so he makes some valid points, but some of these are often unnecessarily repeated throughout the book. Naturally this book is generally focused on the scientific factor, as this is where the author’s strengths lie. However to complement this he admits his previous lack of knowledge regarding philosophy and sociology, which is greatly beneficial to the general scientific reader, who likewise will have a limited knowledge. The only criticism here is that when discussing the core aspects of philosophy, he doesn’t challenge them or discuss them subjectively. Personally I very much enjoyed his book, the majority of what he said was insightful and certainly makes you realise that the scientific community as a whole (not just in the field of astrobiology) needs to make more effort at involving the public in major scientific endeavors and discoveries. The title could be seen as slightly misleading, as he only discusses the involvement and implications of astrobiology in society towards the end of the book. However, when he does he raises some important issues, within which he illustrates that our preconceptions could often be wrong about what it would mean to society and religion if we found extraterrestrial life, and that scientists can be very ignorant when it comes to communicating to the public domain. To finish, there is an extensive list of references at the back of the book, which would prove extremely useful to anyone who is so convinced by the need to integrate society and science they wish to pursue it further.